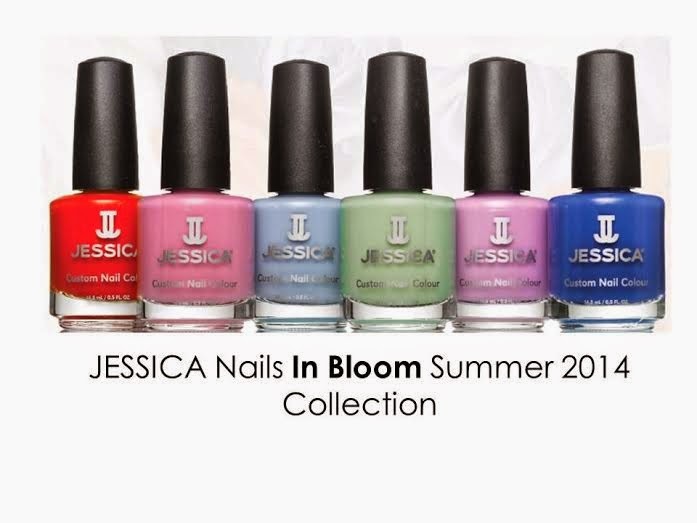 Just before my holiday, I was invited to the launch of the Jessica 'In Bloom' collection. I got to have my nails done by a Jessica rep while she took my through the brand and the collection. I didn't know that Jessica is actually a person - Jessica Vartoughian - who founded her first salon in 1969. She is still CEO of the company! The Jessica brand really seems to focus on a slightly more clinical side to nail care. The nail technicians are called 'Nail Cultivists' and they analyse your nail before they start to try to use a specific regime for your condition. They have lots of different treatments as you can see above including different nail files and base coats for different problems. The event was really fun and I feel I really learned a lot about Jessica which I didn't know already. I picked a pretty hot pink for my own mani which was not part of the In Bloom collection. However, I was given some Jessica In Bloom products to try at home. I was given two beautiful colours from the collection as well as the Brilliance quick dry top coat and some Nourish cuticle cream. The purple is called 888 Awakening and the blue is called 885 Enchanting. I started off using the cuticle cream to get my cuticles looking pretty. This is almost like a butter or gel. It goes on smoothly and really works wonders, however I did find the smell a little medical. I used two coats of the purple and then applied the light blue using a dotting tool. I topped it off with Brilliance top coat. I really, really like the top coat. It makes everything super smooth and shiny and makes your nails dry very quickly. I can see myself using this a lot. I don't have colours like either of the colours shown here. The blue reminded me of Barely Blueberry from the Gelato Collection which I bought earlier in the year. Barely Blueberry is far lighter though, almost white compared to Enchanting. Awakening is a pastel purple but approaching a greige. The products are available in salons and at www.frenchbeautyroom.com for €12.95 each. Perfect for summer! Love the nail look you created! Thank you! Different take on French!